Is A Sharp Stock Market Crash Ahead? I’ve warned for years, and with increasing frequency of late, that the first crash when a major stock bubble of this magnitude finally tops is 42% in the first 2.6 months. That’s the average of seven bubble crashes in the last century. 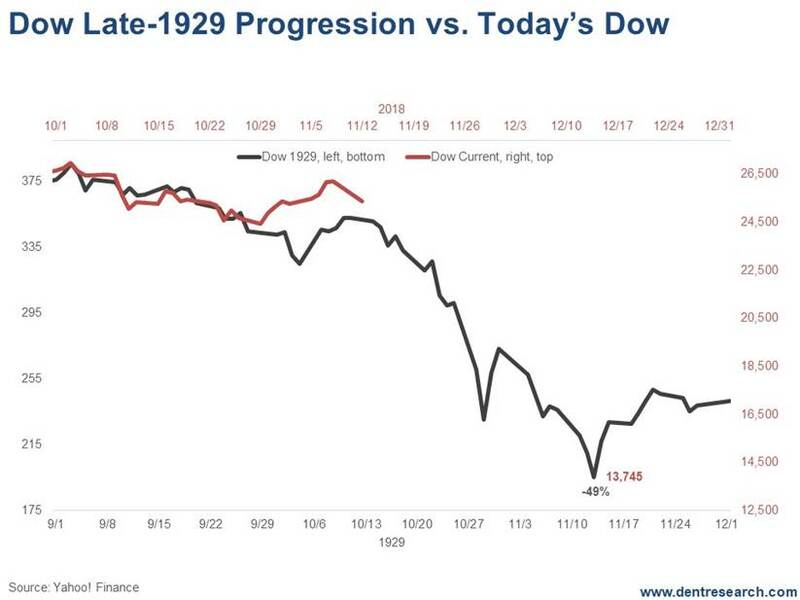 The 1929 crash started off with a 49% crash in just over two months – the most extreme. If it continues to follow the dramatic crash pattern of early September to early November 1929 then the most violent wave down could be starting now… and this first overall crash could be over by early December or as late as early January. The target in that scenario would be at February’s crash low of around 15,500 on the Dow, down 42.5% from the late September top. This one suggests that the smart money hasn’t been buying into the rally from February through September 2018 and could be leading the selling here, which would be ominous and increase the likelihood of such a 40% or so crash just ahead. This index measures the buying into the close (calculated smart money) versus the buying right after the open (dumb money reactions). This is both the sharpest and deepest crash in this indicator. The drop in this index was 20% just before and into the early part of the 2000 tech crash. It was down 24% just prior and into the 2007-08 crash. This decline is 38% and straight down! 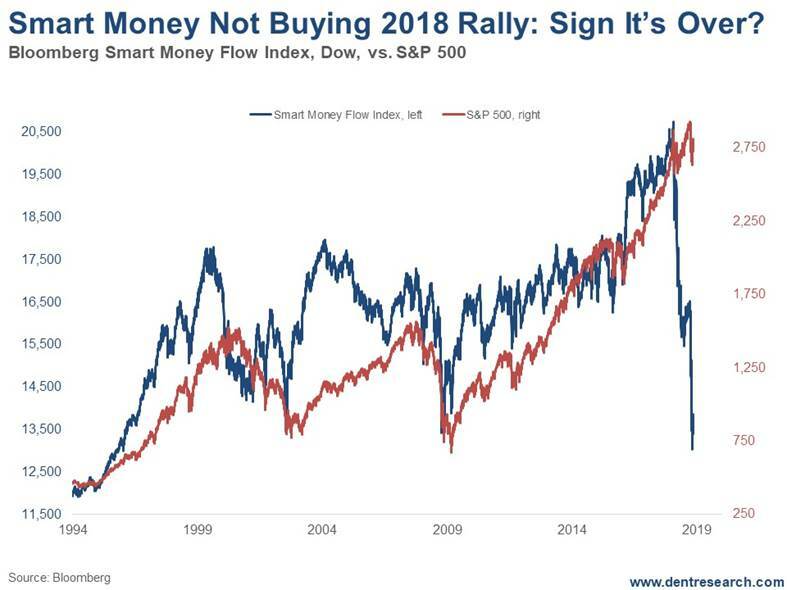 If that is a correct measure of the smart money sentiment, then they not only didn’t buy into the rally that peaked in September while the dumb money was piling in the most, but they would be selling and shorting into this decline and on any bounces. All of this is to warn you that the next two or three weeks is a dangerous period. If late September was a major top, then we should see a sharper deeper wave down any day and it may already have started. This continues to be a good time to hedge through options near term, as Rodney proposed in the November issue of Boom & Bust. If we don’t see such a sharp crash by early December, it isn’t likely to happen. That would be the time to exit such option strategies as December is otherwise a good month. Even if this imminent crash doesn’t happen, your hedging options could have some profits if the markets just go down more modestly. But you’d have to be willing to lose your premium if the markets head back up strongly instead. Make sure you’ve read the latest issue of Boom & Bust for the details.